you foster vibrant Jewish communities and an enduring Jewish future! Every Spertus Institute course, exhibit, program, and presentation is made possible by charitable donations from individuals like you. And every single contribution makes a meaningful difference, sustaining Jewish learning and culture, cultivating Jewish community leadership, and fostering the vitality of Jewish life here at home and around the world. Spertus Annual Fund contributions are 100% tax deductible. All new or additional gifts will be matched dollar for dollar by a generous anonymous donor. In 2024, Spertus Institute will reach a key milestone: 100 years. A century of fostering Jewish scholarship. A century of training Jewish leaders and educators to skillfully serve their communities. A century of preserving Jewish history and showcasing Jewish art, literature, and culture. A century of providing compelling ways to discover and celebrate the Jewish experience. A century of serving as the central address for Jews of all backgrounds and practices to come together and learn. A gift or bequest to the Spertus endowment ensures that Spertus Institute advances Jewish communities, organizations, and individuals for generations to come. Your gift to the endowment is a powerful investment in the Jewish communal future. Those who make a cash gift or sign a Declaration of Intent will be welcomed into our Second Century Circle. For more information, contact Spertus Vice President for External Relations Ellen Hattenbach at ehattenbach@spertus.edu or 312.322.1262. Spertus Institute is proud to be part of the Jewish Federation’s Create a Jewish Legacy program, designed to train and support Chicago’s Jewish schools, agencies, and synagogues in the area of legacy giving. 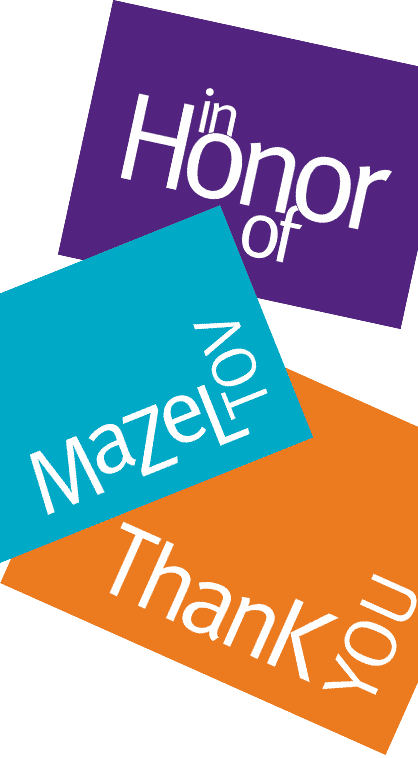 Thank You, Mazel Tov, or Memorial card with your gift of $36 or more.